Because they run fast and they breed too quickly. Geckos are a real nuisance. I know, I know, they eat mosquitoes and other bugs. I get that, I do. I also get that they pee and poop everywhere, including all my dishes and pots and pans, so I not only have to wash the dishes after the meal, but I also have to wash the dishes *before* the meal. And I have to wipe off their crap off of everything. So, no, not really a win-win. This picture is, of course, taken in Sri Lanka. Geckos aren't as much of a problem in Singapore simply because there just aren't as many insects here. 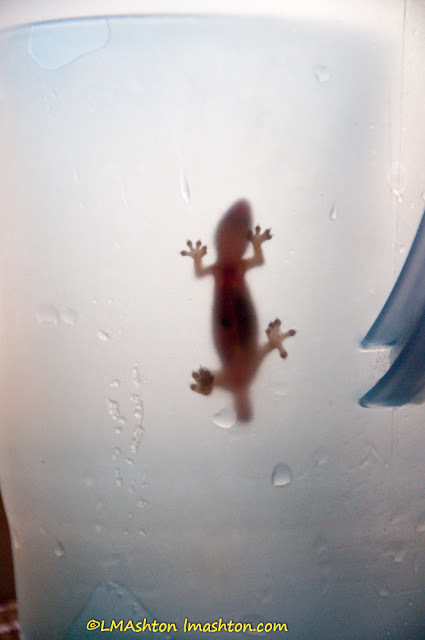 And this gecko climbed into a juice jug. Through the very narrow spout. And couldn't find its way out again, even though the same space he got in was still there. So I had to deal with him instead. Pfft!